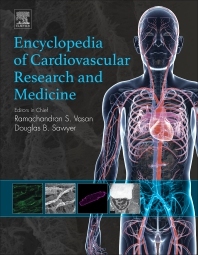 Encyclopedia of Cardiovascular Research and Medicine offers researchers over 200 articles covering every aspect of cardiovascular research and medicine, including fully annotated figures, abundant color illustrations and links to supplementary datasets and references. With contributions from top experts in the field, this book is the most reputable and easily searchable resource of cardiovascular-focused basic and translational content for students, researchers, clinicians and teaching faculty across the biomedical and medical sciences. The panel of authors chosen from an international board of leading scholars renders the text trustworthy, contemporary and representative of the global scientific expertise in these domains. The book's thematic structuring of sections and in-depth breakdown of topics encourages user-friendly, easily searchable chapters. Cross-references to related articles and links to further reading and references will further guide readers to a full understanding of the topics under discussion. Readers will find an unparalleled, one-stop resource exploring all major aspects of cardiovascular research and medicine. Provides a multi-media enriched color-illustrated text with high quality images, graphs and tables. Physician-scientist with focus on heart failure leading research and training program developing novel insights into pathophysiology of cardiovascular disease and innovative strategies to prevent and treat advanced heart failure. Vasan is a noninvasive cardiologist with specialization in cardiovascular epidemiology, and a senior investigator at the Framingham Heart Study. He is the co-director of the echocardiography and vascular testing laboratory at the Framingham Heart Study and he directs its fellowship training program. His epidemiological research has focused on 4 inter-related areas: a. the epidemiology of congestive heart failure, including identifying risk factors for the disease, characterizing the subgroups with diastolic heart failure, asymptomatic LV systolic and diastolic dysfunction, and evaluating the role of LV remodeling; b. population-based vascular testing and echocardiography, including identifying biological, environmental, and genetic determinants (correlates) of cardiac structure and function; normative standards; detailed assessment of biomarkers of the process of LV remodeling; c. epidemiology of high blood pressure, including characterizing the lifetime risk, rates of progression and risks associated with various degrees of elevation; and, d. exercise physiology, and exercise test responses in asymptomatic individuals and prognostic information; relations to endothelial function.